Courtesy After attending a rain forest preservation conference in Peru, Gina Murphy-Darling has taken to the radio waves to help inform listeners about the changing world and its environment. Ten years ago, Gina Murphy-Darling had an epiphany—a brilliant idea which spawned Mrs. Green's World. It is now celebrating a decade of making a positive impact on where and how we live. Stepping into a role she felt she was destined to fulfill, she began raising environmental IQs and taking action to preserve our planet by inviting cutting-edge leaders in the eco world to share their knowledge about climate, energy, technology, healthy living and the like. "I think I was born to inform and engage others in the movement toward global sustainability," she said. "We challenge people to think, but we don't tell them how to think. Our listeners are invited to join in creating a world filled with hope, possibility and change for a sustainable future because collectively, every individual change ends up making a much bigger impact." The lightning flash occurred when the then corporate executive attended a rainforest preservation conference in Peru. She returned to Tucson and launched a half hour radio show on KNST ("Mrs. Green Goes Mainstream") in 2008. "I had no business starting a radio show, but the planet needed me," she said. "It was a Kodak moment, a journey of love and passion. At this point, we're not just an hour-long podcast, we're a movement." 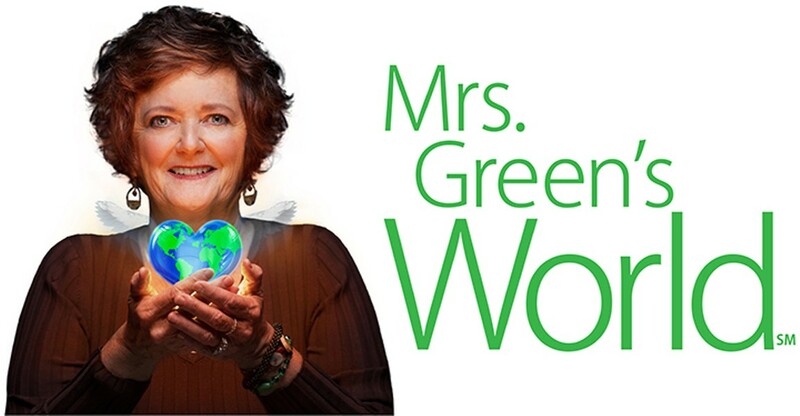 Podcast shows are released every Tuesday and Thursday on MrsGreensWorld.com and iHeartRadio. "From the start, no matter what we did, it had to have integrity so we would be trusted," she said. "To the extent possible, we also wanted to be non-political. Climate change, social justice, and sustainability of the plant are not political issues and shouldn't be divisive." The journey hasn't always been smooth, but filled with "hope, inspiration, joy, and yes, pain at times." "Climate change is irrefutable, it's a faceless villain," she said. "For instance, carbon emission levels are now at 400 parts per million while 350ppm represents the start of the danger zone. It's a clear and present danger and our mission is to activate the matrix so people have the information that supports that urgency to make more conscious choices. On our show, we don't just make noise, we make a difference because this is truly a race against time." So, with a decade of inspiration and perspiration now in the history books, what does the view look like in the rear view mirror? Have her efforts moved the needle? "We've changed peoples behaviors, raised their consciousness about issues that matter to them and the planet, and in the process, created an ever-growing community," she said. Sounds good, but is there data to support that contention? "Well, we've gone from zero to close to 6,500 Facebook followers," she said. "Our newsletter now goes to 4,500 readers and our radio listens have grown from just close friends and family at the start to close to 70,000 a month today. It's been slow, but steady, growth with listeners throughout the U.S., and in Australia, New Zealand, and the United Kingdom." There have been lots of points of pride along the way, but the decade's reflection message is this: "I can say, hopefully without sounding hokey, that I'm so pleased that Tucson is our national headquarters. We have so many environmental rock stars in the Old Pueblo and I want to do everything I can to put a spotlight on the sustainability and social justice issues." Approaching the age when many of her counterparts have already filed for retirement, she still gets by on a few hours sleep and long days pursuing the cause, a process that would make many younger people weary, but re-energizes Mrs. Green. Is she good for another 10 years? "No question," she replied. "I think we now have more clarity that we had a decade ago about our value statements. We have a broader interpretation of what the concepts of sustainability and social justice really mean and how we can move closer to them. It all started with 'Reduce-Reuse-Recycle' and now it's how do we continue to evolve toward the goal of sustainability?" Without preaching, Gina Murphy-Darling offers some motherly, from-the-heart advice: "Please, please, believe me that you can make a difference. Your every day actions have an impact on the health and future of the planet—your water use, where you shop, the food you eat, the trash you produce—all of us are both the source of the challenges we face, and therefore can be the solution to those human-caused issues."